One of the main features that differentiated Google ads and Facebook ads from each other about a year ago was setting the budget of relevant campaign at the ad set level (although it was at the campaign level in the Google ads). However, as a result of the technical improvements made a year ago, the Facebook team has provided to the advertisers a service where the budget is set at campaign level and, if requested, where it is possible to create a bid strategy at the ad set level. 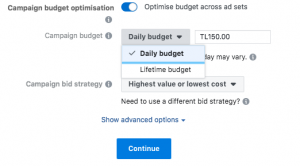 Accordingly, Facebook advertisers had the opportunity to place an ad in the layout they are used to by defining a budget (daily or lifetime) at the ad set level, or to set a budget at the campaign level. With this feature, the advertisers will no longer have to make a separate budget forecast for each ad set, and the budget allocation will be optimized by the system to convey the investment to an ad set that works better thanks to Facebook’s algorithm. How is Campaign Budget Optimization Established? It is important that this method should not be confused with A/B Test. Facebook does not select a winner among the existing ad sets; it allocates the budgets ensuring that the budget is lower or higher according to the performance of the ad sets throughout the ad flow. In fact, we are familiar with this system where there’s more than one ad in a single ad set: budgets of different ads within the ad set is similarly allocated according to the performance of the relevant ads. For some objectives, it is possible to manage the budget allocation using the bidding strategy feature at the ad set level. It is also possible to define a minimum and maximum budget for daily spending under “Ad Set Spend Limits” at the ad set level. However, Facebook does not recommend setting a maximum limit. If you do this, an ad set with a good performance will spend up to the maximum, and even if the ad set’s performance is good, it will not achieve its potential success as the spending is limited. Instead, if you especially want the performance of one or more ad sets separated from others, you are suggested to take into account using the bidding strategy primarily. 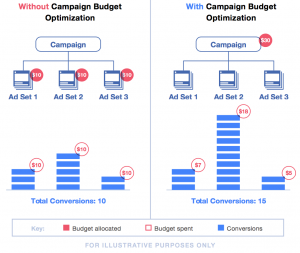 How Does the Campaign Budget Optimization Work? In order to explain this, let’s take a look at the example published by Facebook. Let’s say you have three ad sets and you’re planning to spend $10 for each set. When you enter the budget at ad set level, we see that the 1st ad set has 3 conversions (unit cost of $3.33), the 2nd ad set has 5 conversions (unit cost of $2), and the 3rd ad set has 2 conversions (unit cost of $5), and that total 10 conversions have been obtained from this ad. When you invest a budget of $30 at the campaign level and let Facebook to allocate the amount, we see that the 1st ad set has 3 conversions (unit cost of $2.33), the 2nd ad set has 10 conversions (unit cost of $1.8), and the 3rd ad set has 2 conversions (unit cost of $2.5), and that total 15 conversions have been obtained from this ad. And the unit cost throughout the campaign reduces from $3 to $2. Another benefit brought by this structure is to not losing the learning process at the ad set level. If you are making sharp changes between two or more ad sets that affect the learning of the ad set during budget transfer, then you lose the learning you’ve obtained in time, and start the publishing process as if you have just created the ad set. However, if you make the budget optimization at the campaign level, the budget transfer will take place automatically in this learning process, and will eliminate the risk of information loss. We do not know if the system works exactly like this, but it is obvious that its contribution to the efficiency will be high when such a structure is established. While making these statements, Facebook emphasizes that you should draw attention to the campaign level performance, not at the ad set level when you report the process. This structure is available for all the objectives. However, the bid strategies offered as an alternative in each objective differ from each other. 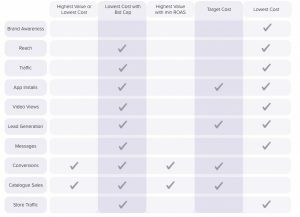 In the following table, we summarized which bid strategy you can select for which objective. While ending this article, we would like to underline the fact that many bloggers suggest that tests should be carried out in advance in order to better manage the impact of the change in the system in September on the ad performances.